"documented dramatic variability in the radiative cooling on timescales ranging from days to the 11-year solar cycle...Current solar maximum conditions, evidenced in the rates of radiative cooling, are substantially weaker than prior maximum conditions in 2002–2003. The observed changes in thermospheric cooling correlate well with changes in solar ultraviolet irradiance and geomagnetic activity during the prior maximum conditions. NO and CO2 combine to emit 7 x 10^18 more Joules [111,111 Hiroshima bombs] annually at solar maximum than at solar minimum." 1. It is well accepted that CO2 is the most important cooling agent of the stratosphere, mesosphere, and thermosphere, and that Earth's stratosphere has cooled slightly due to an increase of radiative surface area due to the increase of CO2 levels. It's analogous to putting a larger heat sink on your microprocessor which increases radiative surface area and causes cooling. Q: Why does CO2 allegedly have opposite net forcing effects of warming the troposphere and cooling the thermosphere? 2. Climate scientists claim that solar activity is essentially constant [hence the use of a "solar constant"], and thus claim that the Sun cannot be responsible for climate change/global warming. This is based on looking only at changes in total solar irradiance [TSI], which only changes 0.1% over cycles, while ignoring huge changes in the solar spectrum such as UV, which changes up to 100% over solar cycles. As this paper points out, the change in UV over days to the 11-year solar cycle is what causes the "dramatic variability" of CO2 cooling. The change in UV also greatly affects the rest of the atmosphere via ozone production, increased heating and penetration depth of the ocean, etc. Thus, the claim that the Sun cannot be responsible for climate change is false and ignores spectral changes, solar amplification mechanisms, etc. 3. The decreased solar activity of the 21st century is unprecedented in the modern age and has caused a complete collapse of the thermosphere in 2008-2009. What are the effects of this on the climate of the troposphere? Unknown. 4. The CO2 cooling mechanism of the thermosphere is another self-regulating homeostatic mechanism of the atmosphere. What are the effects of this on the self-regulation of the climate of the troposphere? Unknown. 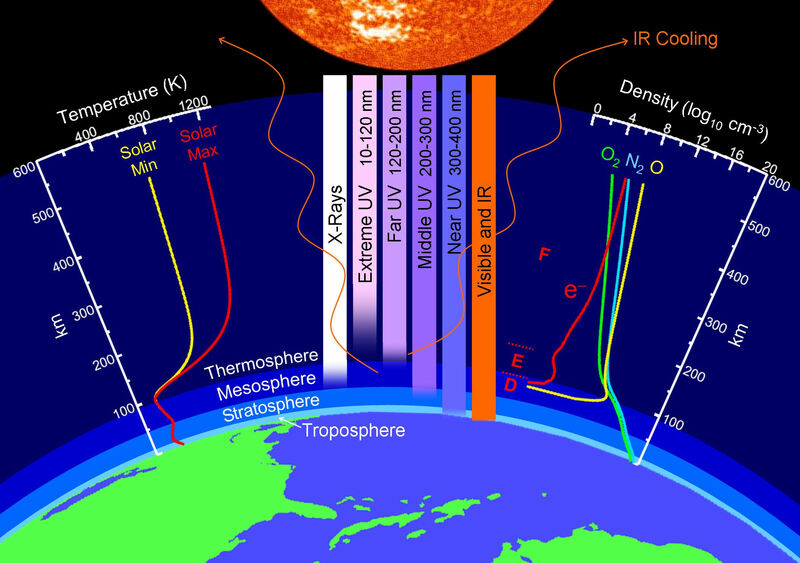 Infrared radiative cooling of the thermosphere by carbon dioxide (CO2, 15 µm) and by nitric oxide (NO, 5.3 µm) has been observed for 12 years by the SABER instrument on the TIMED satellite. For the first time we present a record of the two most important thermospheric infrared cooling agents over a complete solar cycle. SABER has documented dramatic variability in the radiative cooling on timescales ranging from days to the 11-year solar cycle. Deep minima in global mean vertical profiles of radiative cooling are observed in 2008–2009. Current solar maximum conditions, evidenced in the rates of radiative cooling, are substantially weaker than prior maximum conditions in 2002–2003. The observed changes in thermospheric cooling correlate well with changes in solar ultraviolet irradiance and geomagnetic activity during the prior maximum conditions. NO and CO2 combine to emit 7 x 10^18 more Joules annually at solar maximum than at solar minimum.